Interestingly enough, the Solemnity of the Annunciation occurs most commonly in the season of Lent. There are rare days in the calendar when Good Friday itself occurs on 25 March. Of course, the Annunciation is then appropriately celebrated after Easter. The point of interest is the fact that we mark the human conception of Jesus, the Son of God, at a human place and in a human way and to a fully human woman—the Immaculate Virgin Mary. There is an additional word on the Altar frontispiece that can only be added in this Sanctuary: “hic,” that is, “here.” “The Word was made flesh here.” The Blessed Virgin Mary received the visitation of the Angel Gabriel and the Annunciation of her Divine Maternity was made and accepted—here. 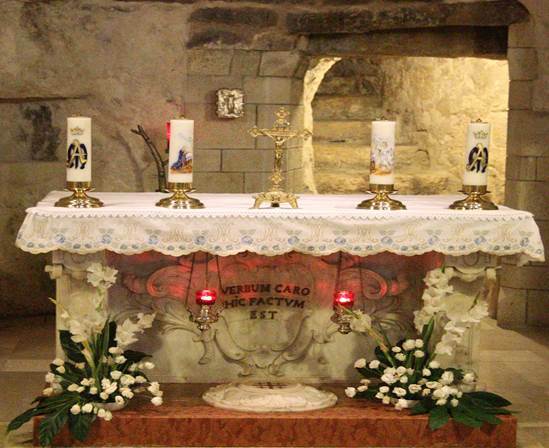 In that place and in that instant, Mary became the Mother of God. Of course, the celebration of the Nativity of the Word made Flesh takes place on 25 December—Christmas Day—nine months after the Annunciation. While there are no ancient calendars that mark these events and track them to these specific dates, the point of their occurrence in human history is verifiable. We know that Jesus existed in time and His life has been chronicled not only in the Sacred Scriptures, but in other secular accountings of the times. For us, this is an opportunity to ponder the birth of Jesus while we reflect most seriously on the fundamental gift of His life—the Redemption of all humanity and the restoration of Unity with God, Whom He, Jesus, revealed to us as Our Father. As we celebrate the Annunciation we remind ourselves, most certainly, that Jesus is “God from God, Light from Light, true God from true God…and by the Holy Spirit was incarnate of the Virgin Mary, and became man.” These words from the Nicene Creed that we pray each Sunday at Mass situate the humanity and divinity of Christ in our human history and give purpose to His teachings in our day-to-day living. In Jesus, God has walked among us in our flesh. He has shared our humanity and He has born our transgressions. In Jesus, human flesh is Redeemed and Rises to Glory. The victory over death and the promise of future glory is the promise of heaven. These are the realities that ground our hope and form the proclamation of Good News. Please celebrate the life of Christ (in you) at Sunday Mass! This entry was posted in Uncategorized on March 24, 2014 by dioceseoflacrosse.